maintainability. It features the SYSTEM R-J3iB intelligent robot control system. The 165R is a 165kg payload robot with an expansive 2928mm of reach. This is a pedestal or shelf type robot; it is mounted above the work area and will work below itself. 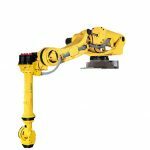 This makes the R-2000iA 165R ideal for palletising and packaging applications as well as machine tending where access is from above is required.